This year marks Chevron’s 140th anniversary – a milestone that prompts reflection on our history and admiration for the extraordinary women and men who have built a lasting company based on the belief that energy is vital to human progress. This purpose is even clearer now than it was in 1879. Today, Chevron touches the lives of billions of people across the globe, delivering affordable, reliable, ever-cleaner energy that offers access to the necessities of modern life, drives economic and social development, and creates the promise for a better future. We feel proud and privileged to fulfill this responsibility, to invest in the communities where we operate, and to generate sustained value for our stockholders, customers and employees. Our strong performance in 2018 enabled us to deliver on all of our financial priorities – growing the dividend, funding a disciplined capital program, strengthening the balance sheet and returning surplus cash to stockholders. For the 31st consecutive year, Chevron increased the annual per-share dividend payout. We returned an additional $1.75 billion of cash to stockholders through stock repurchases. In addition, we further strengthened the balance sheet, reducing our debt ratio to 18 percent. This performance reflects momentum across all our operating segments. Our Upstream business reported a highest-ever worldwide net production of more than 2.9 million oil-equivalent barrels per day, up more than 7 percent from 2017 and 12 percent from 2016. Production increases were driven by Permian Basin growth, startups in the Gulf of Mexico and Australia, continued ramp-up of liquified natural gas (LNG) operations in Australia, and a high level of reliability at Tengizchevroil in Kazakhstan. We added approximately 1.46 billion barrels of net oil-equivalent proved reserves, replacing 136 percent of production. Our five-year reserve replacement ratio is 117 percent. Chevron increased development drilling in the Permian Basin, and we expect continued strong production growth in the Permian over the next several years. We also acquired new exploration acreage, including six blocks in Brazil and 31 blocks in the Gulf of Mexico. Construction continued on the Future Growth Project and Wellhead Pressure Management Project in Kazakhstan, including first module delivery and installation. Permian Basin: Chevron and its legacy companies have been a ﬁxture in the Permian Basin, which is located in the southwestern United States, since the early 1920s. In 2011, Chevron produced its 5 billionth barrel from the Permian. Today we are among the largest producers of oil and natural gas in the basin, and with approximately 2.2 million net acres (8,903 sq km), Chevron is one of the Permian Basin’s largest net acreage holders. In Downstream & Chemicals, we commissioned a new hydrogen plant as part of the Richmond Refinery Modernization Project. In our Oronite additives business, we broke ground on our blending and shipping project in Ningbo, China. Chevron Phillips Chemical Company commissioned its world-scale ethane cracker at the Cedar Bayou facility as part of the U.S. Gulf Coast Petrochemicals Project. We also expanded our new retail marketing network in Mexico, with 135 stations opened as of year-end 2018. Our Midstream business delivered the first LNG cargo from the Gorgon project to the new LNG receiving terminal in Zhoushan, China, an important achievement that will help China meet its goal of increasing natural gas in its overall energy mix. In the Permian Basin, Chevron strategically secured pipeline capacity to maximize value in advance of our production ramp-up. Our Shipping organization supported the safe and successful delivery of the first modular component to the Future Growth Project in Kazakhstan – a voyage of nearly 17,000 miles. Chevron delivered these results in a year characterized by healthy global economic activity and heightened geopolitical tensions. Global liquids demand surpassed 100 million barrels a day for the first time ever. Commodity prices rose during the first nine months of 2018, driven by strong demand, before declining in the last quarter. LNG markets continued to respond to strength in Asian gas demand. The return of U.S. sanctions on Iran, volatility in the Middle East, trade tensions between China and the United States, Russia sanctions, and worsening conditions in Venezuela created further uncertainty for global energy markets. Although market conditions may remain volatile, our portfolio is resilient. We are focused on creating value through a disciplined capital program that prioritizes efficient, low-risk, short-cycle investments. Our Upstream portfolio is anchored by large, long-lived assets with low production decline. An efficient, high-return Downstream business complements our Upstream. Across all our business segments, we are accelerating the deployment of digital technologies to improve revenues, reduce costs, increase reliability and improve safety. We are making smart investments and building our company to win in any environment. In 2018, we also had our best year ever in health, environment and safety performance, with no fatalities of employees or contractors in any of our operations. We continue to lead the industry in personal safety performance and meet or exceed targets on all core personal safety metrics. This performance is directly related to our strong Operational Excellence culture and an increased focus on safeguard assurance for high-risk work. In every instance, Chevron’s performance rests on the strong foundation created by our people and our culture. The environment in which we operate is dynamic. The biggest questions of the future remain unanswered. Our work is complex and demanding. Yet for 140 years, the ingenuity of our people has led to new insights, new discoveries and new innovations. This is not a coincidence. Our culture is defined by our values, which emphasize a deep commitment to diversity and inclusion, high performance, innovation, integrity, and trust. This has been part of our DNA for decades. To hold ourselves to this high standard – and to ensure an effective approach to human capital management – we regularly seek employee feedback to understand where Chevron is performing well and where we can further improve. Our Board of Directors takes this input seriously – and we act on it. Based on feedback, we are working to Build Our Tomorrow, by putting new digital technologies in the hands of employees, promoting better, faster decision making and revamping our performance management system. 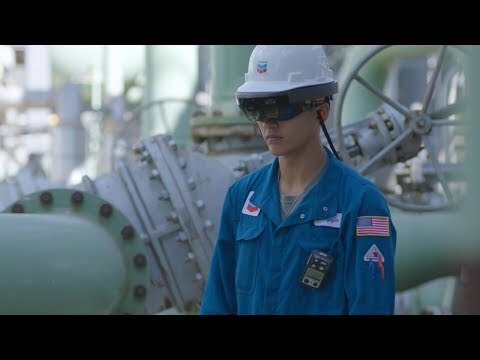 Microsoft video (Chevron is permitted to share and collaborated on the work) featuring Chevron’s use of HoloLens augmented reality technology. We use social media and other platforms to create access to information, remove organizational barriers, and bridge vast geographic expanses to exchange ideas and communicate. These are just some of the ways we put The Chevron Way to work, ensuring a culture in which all voices are heard, all ideas are considered and all our people have the opportunity to contribute to their fullest. Actions like these are essential in today’s environment. But we recognize that leadership goes well beyond delivering strong financial returns and creating a compelling work experience. We must also deliver value for society. We provide the affordable, reliable, ever-cleaner energy needed to meet rising demand. By 2040, the global population is expected to reach roughly 9 billion people, and the International Energy Agency expects global energy demand to increase by nearly 30 percent. Our strengths across Upstream, Midstream and Downstream position us to help meet society’s growing need for energy. We will meet this demand in a way that respects society’s concerns about climate change and aspirations for a cleaner environment – views we share. This requires innovation. In 2018, we launched the $100 million Future Energy Fund, a venture capital fund established to invest in breakthrough technologies. Early investments include an electric vehicle charging network, novel battery technology and direct capture of carbon dioxide from the air. We also joined the Oil and Gas Climate Initiative (OGCI), a coalition of 13 global companies cooperating on constructive actions to reduce greenhouse gas emissions. Our commitment includes a $100 million contribution to OGCI’s more than $1 billion fund to invest in technologies and businesses that promise meaningful greenhouse gas emissions reductions. During my first year as chairman and CEO, I visited our operations around the world to listen to and learn from our employees. In my travels, I was often asked: “Why do you work for Chevron?” We work for our families. We work for our communities. We work to make the world a better place. And we work because we are proud of what we do. I am honored to serve the women and men of Chevron. I am humbled by the opportunity to help build on our company’s 140-year history and the work of generations of talented problem solvers who have turned some of the greatest challenges of our time into vast, human opportunities for advancement. I am proud, too, to represent a fundamental truth: energy enables human progress. I am committed to this truth, and I am fully confident that our people will continue to lead in the decades to come. The greatest challenge we face is affordably and reliably meeting the energy needs of a growing world population and at the same time reducing emissions. In 2019, we updated Climate Change Resilience – A Framework for Decision Making, available at www.chevron.com/corporate-responsibility/climate-change, which explains our strategic approach as it relates to climate change, to enhance reporting on governance, risk management, strategy and actions. Our success is inextricably linked to the social progress and economic prosperity of the communities where we work. Our operations deliver good jobs and a better life. They promote the development of communities and enable the economic progress that fosters environmental improvement. In our annual Corporate Responsibility Report, available at www.chevron.com/cr, we highlight our performance in several environmental, social and governance areas. Over the last five years, Chevron invested $154 billion in global goods and services and more than $1 billion in global social programs.